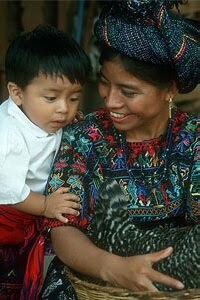 As most of the towns throughout the country, the name of this town is a combination of the name of the Saint Patron, Saint Catherine of Alexandria, and an indigenous word, in this case, the Kaqchiquel voice Palopo that means amate tree, a tree that for the ancient Maya civilizations was symbol of enlightenment, power, and wisdom. Once upon a time, there were lots of amate trees in the surroundings, not any more. 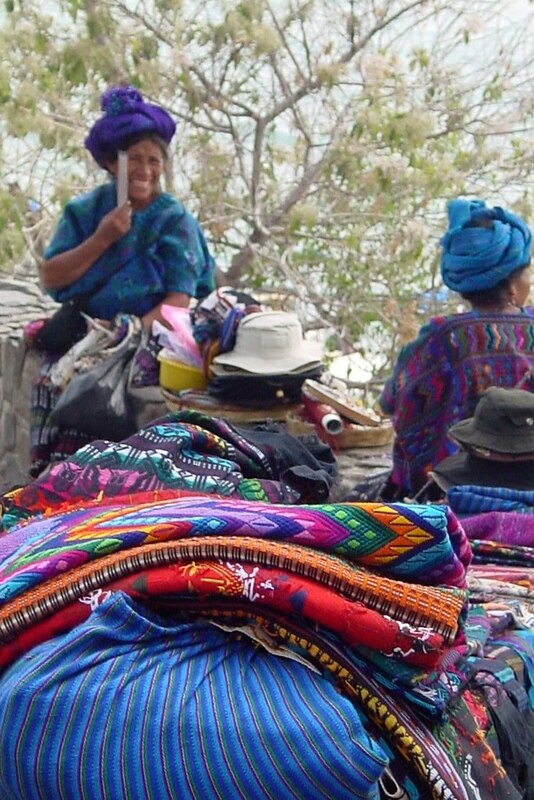 This tiny town, one of the smallest in the country, is right next to Panajachel and just as its neighbor, it hasn't escaped the foreign influence and to prove this, all we need is to take a look at the traditional costume evolution: from the red-white with simple designs, to the blue-turquoise-green with intricate patterns that we admire today. Several decades ago, the typical huipil (blouse) was red and white, quite similar to the one is still in use in San Lucas Toliman. 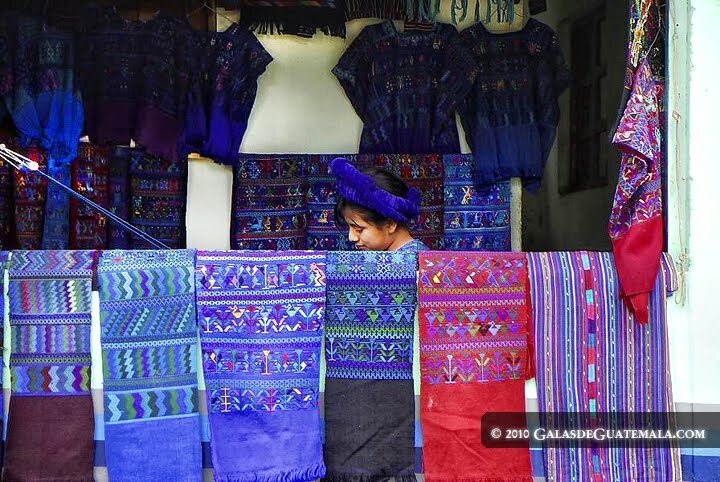 Although there are no official records, the town's people say that one woman from the USA, who lived in Santa Catarina Palopo for many years, hired one of the local weavers to weave a huipil in blues and greens. 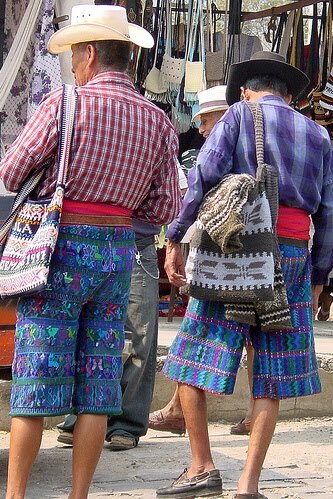 When this American woman wore the huipil, local women loved the colors and they soon began copying it for themselves and also adapting it for the men's pants. As of today, the old red huipil can be seen occasionally worn only by older women. To be honest, the new fashion looks contemporary and it is so vibrant that has become a trademark for Santa Catarina Palopo, and everybody seems to love it, myself included! 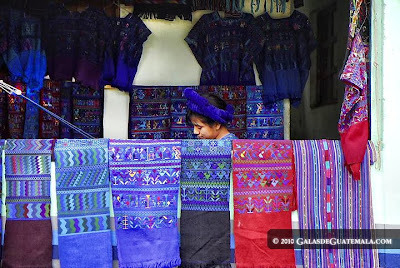 The most important economical activity in the town is the textiles that continue being made by women in backstrap loomers. As for the agricultural activities, men cultivate corn and beans in the highest part of the town and onions and flowers in centennial terraces, utilitarian and also beautiful. In addition to the main festivity honoring the Saint Patron Saint Catherine of Alexandria on November, other important celebrations in this town are the Three Wise Men Day on January 6-7, the Holy Week -for which they make arches with flowers and fruits along the processional routes, Saint Peter the Martyr on April 28-29, Saint Manuel on June 24 to 27, Saint Simon (better known as Maximon) on October 28 -the most meaningful festivity for all the towns surrounding the lake, and the Day of the Dead on November 1-2. The typical food for the main festivities in Santa Catarina Palopo is a succulent stew made with white beans and pork ribs, home-grown hens with a pulique-like recado, grilled fish from the lake, battered string beans bunches, and steamed guisquiles, potatoes, and corn on the cob. Once again, I am craving for some traditional food and my mouth is literally watering. Believe me, the simplest steamed guisquil can become a delicatessen! I found your site by accident! 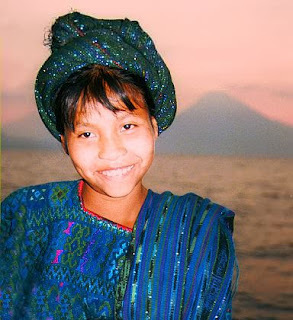 I was going through my closet and came across a beautiful huipil that I purchased in 1996 near Panajachel. I googled huipil to try to remember from which village it came, and found the village of Santa Catarina Palopo. Mine is the lovely and vivid greens, blues, and turquoises and has intricate weavings of cats on the front! Thank you for your site. 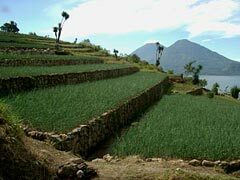 I treasure those memories of my long-ago trip to Guaremala.